At a time where SUVs are all the rage, some sedans have a hard time shining and showcasing their specific characteristics to consumers. That’s not the case for the 2019 Honda Accord, which won the North American car of the year 2018 against 20 solid competitors. 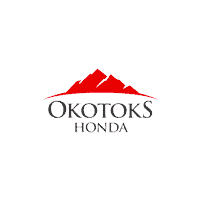 You can find the best sedan of Alberta’s at Okotoks Honda, your local Honda dealership in Okotoks, just 10 minutes South of Calgary and serving all of High River, De Winton and surrounding Calgary areas. One thing is certain: the 2019 Accord is still the queen of its category. The Honda Accord was completely redesigned last year so the manufacturer didn’t feel the need to further update a design that will undoubtedly age well. Lower, wider, shorter: the 2019 Accord’s body was completely redesigned to incorporate new sedans’ design trends, while the front now features a grille very similar to the ones found on the new Civic and Odyssey. The Accord 2019’s cabin has been strengthened to improve the road handling, the soundproofing, the safety and the maneuverability of the vehicle. On the technology side, Honda now offers heated and ventilated seats, and improved its entertainment system accessible via an 8 inches display. Apple CarPlay, Android Auto system are included, of course, as well as all the other entertainment and safety features that are now standard on new vehicles. Honda also hit big on the performance side last year. The 4 and 6-cylinder engines of previous generations have been replaced by turbocharged powertrains. The car comes with a 1.5-liter turbo engine that produces more than 190 horsepower and can be paired with an automatic or a manual 6-speed transmission. If you’re not here to mess around, go for the 2-litre turbo engine which will provide you with 252 horsepower! The only transmission available for this engine is a 10-speed automatic gearbox, another exclusivity of this model. 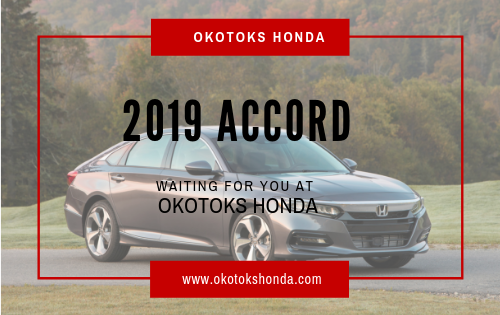 Configure your new 2019 Honda Accord with the Okotoks Honda team – just minutes South of Calgary. The 2019 Honda Accord is the follow-up of solid upgrade to a model already loved by customers. To see, drive and go home with yours, there is only one place to go: Okotoks Honda, your local Okotoks Honda dealership – just 10 minutes South of Calgary. Come into Okotoks Honda, the #1 Google Rated and Reviewed Honda dealership in Canada and the winner of 2018 Honda Driving Excellence Award. Test drive the new 2019 Honda Accord while you get a guarantee trade-in value.